Motor Driving License (LMV/HMV Commercial Driving License) / Cooking / Electrician / Carpentry Multi Skill Trained People preferable. Age: Between 18 years and 27 years as on 1st March 2018. Relaxation for reserved candidates in upper age limit. Experience in House Keeping, Watch and Ward, Security, Caretaking will be preferable. 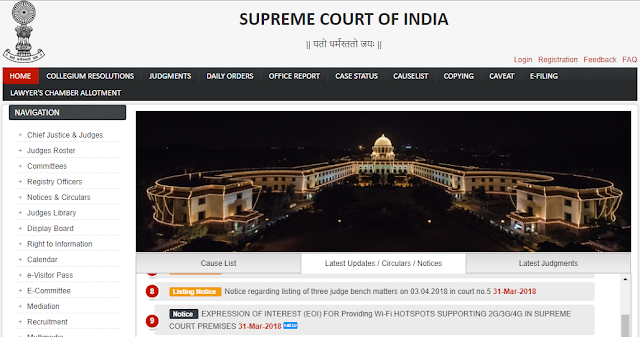 How to Apply Online for Junior Court Attendant, Chamber Attendant in Supreme Court? Interested candidate have to visit the website http://www.sci.gov.in and have to apply online and make the Application Fees Payment Online and Submit the Online Application. For applying both positions separate application to be submitted for both.